Tyneside Community Action Against Racism (TCAR): Supporters of Hassanat Aliyu and her three daughters Teniola, Adunola and Shaniola, take up Theresa May’s call to ‘speak out, stand up against violence against women and girls’ by gathering on International Women’s Day to demand that the imminent deportation of these four women is stopped. Supporters of Hassanat Aliyu and her three daughters Teniola, Adunola and Shaniola, take up Theresa May’s call to ‘speak out, stand up against violence against women and girls’ by gathering on International Women’s Day to demand that the imminent deportation of these four women is stopped. 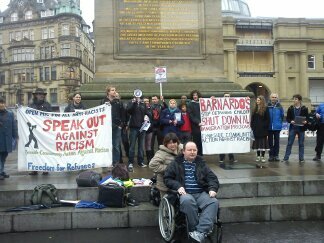 On Friday 9th September Tyneside Community Action against Racism (TCAR) and supporters of Hassanat held a demonstration at Grey’s Monument, Newcastle. Despite it being International Women’s Day the family are being held in Cedars immigration prison against their will and the Home Office intends to deport them this Saturday 9th March. "I'm very pleased to be recognising International Women’s Day, a day that celebrates the achievements of women across the world. But as we celebrate women's achievements, we must also think of the problems that women sadly face all too often in the UK and in other countries across the world... Government will do its bit but I want you all to do your bit too. So speak out, stand up against violence against women and girls and that's the way we can eradicate it." This statement flies in the face of what the Home Office and Theresa May are doing to Hassanat and her girls. They were snatched in a dawn raid at 7am on Wednesday 9th March and locked in a detention centre, despite the government’s commitments to end child detention, and they are to be deported to Nigeria where the sisters Teniola 7 and half, Adunola 5 and Shaniola 3 years old, are under serious threat of Female Genital Cutting, again something the government has made big claims on tackling. Hassanat fled this situation in 2006 with Teniola who was one years old at the time, and has spent the last 6 and half years living in Britain building a life for her family, Adunola and Shaniola were born here. We urge Theresa May to ‘speak out, stand up against violence against women and girls’ and stop the deportation and give the family the right to remain in Britain.